Under this heading I want to first consider three works as a group: Two Tribes, 2012 by Mike Gillam; Fertility, 1993, by David Mpetyane; and, That’s Mparntwe, that’s town, 2013, by Dan Murphy. All three are maps of sorts; between them they chart the territory of this ‘space between us’ and suggest something of the potential and movement within it. Mike Gillam is an artist working in the photographic medium, who has lived in Alice Springs since the early 1970s. He has also long been a campaigner for a better quality built environment, reflecting the town’s natural and cultural settings. Recently he has been giving practical effect to his vision on the property he owns with Maria Giacon, particularly at 8 Hele Crescent. In Gillam’s Two Tribes (right) ‘the space between us’ is figured in the unyielding dark textures of the bitumen. Overlaying it, by grace of a line-marker’s accident, the thick chaotic splash of the Other approaches the straight-edged geometry of the Western rationalist world view. These marks have then been added to by another stroke of happenstance. Two bare-footed people have walked through the splash, leaving their footprints. To the local viewer they read instantly as the prints of Aboriginal people if only because it is not unusual around town to see Aboriginal people going barefoot (it is much more unusual in anyone else). Viewers might also associate the marks with the footprint motif frequently used in Aboriginal art. Gillam’s sharp eye – it is hard to think of anyone else who scrutinises with such acuity the urban environment of Alice Springs – and the knowing deployment of his lens has then delivered the image into our visual record. 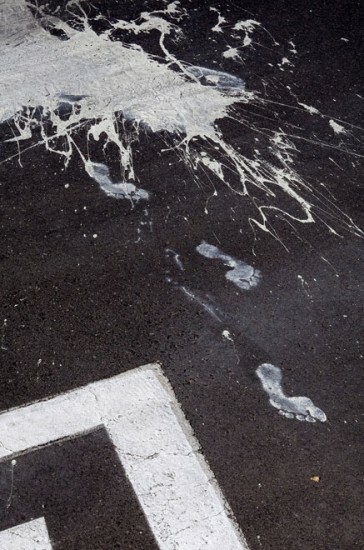 Without the footprints the symbolism of the marks – the grid and the splash – might have remained somewhat arid. With them, a kind of instant archeology is created, a summing up of the current social moment considered in its starkest, yet poignant black and white terms. Most casual, and indeed not so casual, observers stop there. 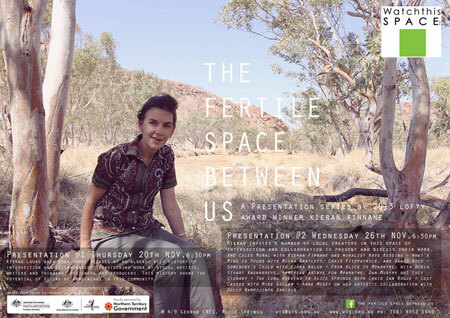 To quote Eleanor Hogan from her book Alice Springs, the two populations, Aboriginal and non-Aboriginal, are seen as in “almost unspoken stand-off”. And on many a day, in many a context you’d think this was accurate enough. But, thankfully, it doesn’t stop there; it hasn’t stopped there. Gillam’s own body of work provides a lot of rich evidence of this. Before moving on to Mpetyane’s and Murphy’s works, a brief word about who these two are. Mpetyane was an Arrernte man, son of Doris Kngwarreye Stuart, Apmereke Artwe for Mparntwe. I use his name with Mrs Stuart’s permission as her son died well before his time, late in 2008, an enormous loss for his mother and family, and for this town, for here was an artist with strong roots in local Aboriginal life and tradition, using a modernist painting language to express his ideas about what he saw going on in his country. His oeuvre ought to be much better known, both for its own merits and its contribution to our cultural history. Dan Murphy is a sculptor working with found metal, a stalwart of Watch This Space and its current chair. He has lived in town since the early ’90s and has built strong relationships with Mrs Stuart and other Arrernte people. This has included, together with Lucy Stewart, supporting Mrs Stuart in her work to promote a better understanding and respect for the Arrernte sacred sites that are all around us. The two works – by Mpetyane and Murphy – were made in ‘the space between us’, almost twenty years apart. They’ve taken shape where Gillam’s seeming impenetrable bitumen has yielded. Interestingly they each adopt one of the key elements that Gillam uses – Mpetyane the grid, and Murphy, not quite the splash but an anti-geometry, a kind of circular dance. Both also adopt an aerial view. 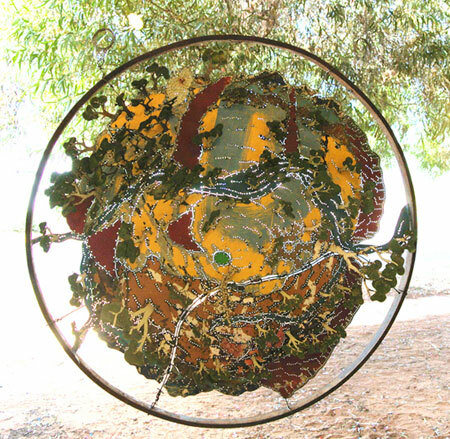 In Fertility (left, courtesy Araluen Arts Centre) Mpetyane’s bird’s eye follows a long swoop north from The Gap – Ntaripe. He takes in the grid of streets sitting harshly on Arrernte country, yet unable to obliterate its great structures – the ranges, the river and creeks – and its seething life. This ground is very animated. I won’t presume to say more about Mpetyane’s view of this except to say that the aliveness of his rendering of the land beneath the grid suggests that this is what he also felt and believed. Next a shed then a house. This account of the town’s history ventures something that is not often said or acknowledged – that the development of the modern town here in Arrernte country has been a two-way process, mutually transformative. There’s loss and wounded-ness, compromise and confusion but also a kind of generative union – a fertility. I’ll come back to this later, but first let’s look at Dan Murphy’s Mparntwe/town (below). The artist has tuned into that same sense of aliveness, infusing the land with an almost wild energy, sending it spinning. No sign of the grid – it’s been spun off the map, with only the railway line and the footy oval remaining. And all around – the hills, trees, ranges, river and creeks are in a wonderful circular dance, radiating energy. In an earlier consideration of this work I wrote that it represented Mparntwe as the Arrernte “know it and live it”. But in thinking about it now, I ask whether on better days non-Aboriginal residents of Mparntwe are not also borne along on this energy, whether the land doesn’t also claim them? If, in ‘the space between us’, the land does not bind us to one another? This takes me back again to the Shifting Ground forum and the insights of a visitor, Cameron Tonkinwise. Shifting Ground, a month-long program held in March 2007, arose out of a process titled Art~Land~Culture beginning in 2005. It was one of the high points of Watch This Space’s achievement over its 21 years. It owed much to the vision and organising energy of the Space’s coordinator at the time, Kieren Sanderson, though she was obviously spurred along and supported by a steering group as well as a wider circle of interlocutors. Its legacy was picked up the following year by Imagine Alice, to coincide with the national Regional Arts conference being held here. This was again a program of art and ideas, developed in partnership by Watch This Space and Red Hot Arts. Dan Murphy was its artistic director and Lucy Stewart, the program manager. Together with Doris Stuart they followed up by co-curating the exhibition Pmere Arntarntareme / Watching This Place, which opened at Araluen, in November 2010. This was a Watch This Space initiative and grew out of a process involving 36 local artists in “looking, listening and connecting to country”. Mrs Stuart’s message was clear: she wanted to continue this kind of process – “where there’s no them and us”. These were important steps in the evolving cultural movement that I’m describing, but Shifting Ground had the distinction of determinedly reaching outside of the arts arena – taking art into everyday public places and engaging non-arts people, such as public servants from a range of departments, in a day-long forum, packed with guest-speakers and discussion. Sanderson called it an “ideas incubator”. It was there that Mrs Turner made her interesting observations about how she saw Alice Springs – not a mention of buildings, the mall. “The foundation is still here,” she said. “That old tree is still standing,” referring to the grand old tree at the Parsons Street / Todd Mall intersection. And if we take stock, these seven years later, we can see that the town has come to better respect that “old tree”, and I don’t think it is too much to claim that Shifting Ground and Mrs Turner’s interventions helped with the greater awareness of its significance, for the Arrernte and for the town, and that this culminated in the recent works around it. Again, I will come back to this. Also in the “ideas incubator”, the ‘outsider’ Tonkinwise demonstrated his ability to tune in and offer a precise critique of the local cultural situation. If he could do that on Day Two of his visit, it was no doubt because the situation in Alice shares more than we realise with the situation around the country. We are simply in the fortunate position of living it in a more sharp-edged way, which from time to time manifests in the important cultural productions and processes that are my subject. At the time Tonkinwise was director of Design Studies at the University of Technology in Sydney. These days he’s working in the USA. At Shifting Ground, which was focussed on the ways art, especially art in public places, could foster social change, he noted the conservative drift in the discussion towards what he called “plonk art” – the kind likely to attract public and corporate funding. Left: A classic case of ‘plonk art’, particularly the processes behind it. Mayor Damien Ryan and Masonic Grand Master for SA and NT, Brother Ray Clark, walk past the statue of John McDouall Stuart, lowered onto a temporary plinth for its unveiling in August 2010. The statue has now been permanently installed on Stuart Terrace. He called for a greater commitment to “confrontational art”. This would address “the elephant in the room”, which he saw as white envy of Aboriginal belonging, white guilt and hypocrisy in relation to colonisation and its impacts, and the “un-sustainability” of the town, defining this last as “too much stuff, moving too quickly, too far”. 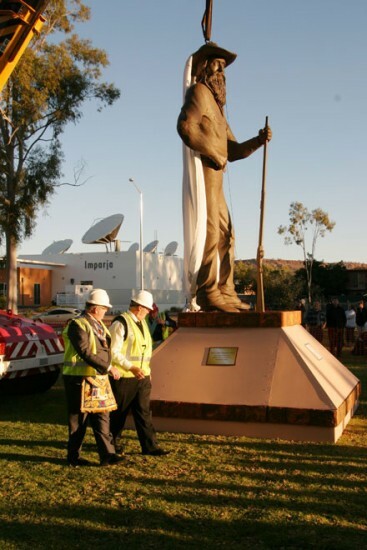 He saw living sustainably as the way in which the white, or non-Aboriginal, population could feel more rooted in Alice Springs, as the only hope of a non-Aboriginal equivalent to Aboriginal connection. His suggestions for public art projects included one that would make visible the underground infrastructure of the town – the ways in which it draws its water and energy, borrowing unsustainably from the land to keep itself going. As far as I know, such a project has not been undertaken – as art – but I see ‘the underground’ in its immaterial or spiritual sense as strongly manifest in Mpetyane and Murphy’s works. I see them as emblematic of ‘this fertile space between us’ – fine flags at the vanguard. Continued /Go to Part 2. Go to Part 3. Go to Part 4. I too was away and unable to attend this presentation, but grateful to have the opportunity to read it here online, and to reflect on your lucid, poignant and uplifting observations, Kieran. What a fitting way to cap off your year as the LOFTY recipient!